I’m always fascinated to hear what people assume it’s like to be a Realtor. These past couple of weeks I’ve had several “back story” situations that I think would surprise most consumers about what are our most key duties, and how much difference an agent makes in the outcome of a deal. And so gentle readers, I hope you’ll allow me to indulge in a bit of pride in my work. My most recent listing was a beautiful contemporary in a park-like garden. After proudly marketing it with handsome photos, a professionally produced video, and very active open houses, we received three lovely offers. But it’s never a matter of just recommending that my clients accept the highest offer. Can I negotiate the offers to be even more lovely than originally presented? In this case two offers had identicle terms, and both were significantly over list. One buyers’ agent presented to me in person, and made it clear that her clients might be willing to go higher if necessary. Another agent shared with me that her buyers wanted her to present to me…but she was awfully busy, she told me. So she presented her offer over the phone, and at the end of the conversation asked if her clients were in the running. At that point I could share with her that there was already a higher offer. She pressed for details. And here is where I enjoy the art of finessing. How you respond, and how much information you share by inference, can make a huge difference to the outcome of the transaction. By giving each of the two agents an opportunity to improve their offers, and making it clear that there truly was competition, both parties came back with improved offers. In the course of those phone conversations the sales price increased by $70K, a dramatically improved result for my seller. I know that without my standing among my colleagues, and years of experience with negotiating, I could not have achieved that price. 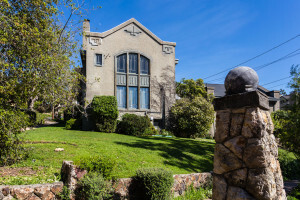 Some of you visited my previous listing, the 1911 Pratt-Thomas House, a John Hudson Thomas masterpiece.After working on it for so many months it feels odd to no longer have that home as part of my work life. With gorgeous original details, but also original systems, I priced it at $1.325M. For that property I also produced a professional video tour, and held a preview reception for neighbors and other owners of historic homes. The property had been featured in several publications, and I invited the author of one to give a brief presentation during that reception. Several hundred people visited during the open houses! It also received three offers, and in that case as well, the final price was not just the result of an exuberant market. Strategic marketing, and lots of negotiating with other agents behind the scenes produced not just a high sales price, but a truly extraordinary one: $1.8M! I’m of course delighted for my sellers, and also hope that the buyers over time will be able to restore that wonderful property. Meanwhile, we’re seeing lots of new inventory, and a bit of softening in the high end of the market. Tech news has not all be positive. So I watch carefully for other signs of a slight change in the market.